The arrival of pitchers and catchers is typically a big deal among baseball fans of every stripe. But as a Mets fan, I confess I am still not emotionally prepared for the 2009 season. Two straight late season collapses — plus the ignomy of watching those Cheez Whiz slurping troglodytes in Philadelphia celebrate a World Series title — will do that to a guy. The Mets were 13th in the league in ERA from the seventh inning on and 13th in bullpen ERA overall. They blew 29 saves — second most in the National League, behind St. Louis. They gave up 61 home runs from the seventh inning on, tied with the Giants for the most in the league. If all games had ended after six innings this season, the Mets would have finished the year 11 games ahead of the Phillies (aka, the team that won the World Series). If all games had ended after seven innings, the Mets would have finished six games ahead of the Phillies. And if all games had even been just eight innings long instead of nine, the Mets would have finished five games ahead of the Phillies. But the rules are the rules. And the rules say they had to play all nine. And it was those final innings that crushed the Mets. The Phillies lost no games they led after eight innings. 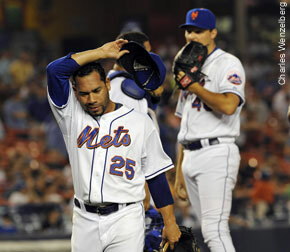 The Mets lost seven of them — and lost 13 games they led after seven innings. That’s how seasons slip away. That’s how one fatal flaw can undermine everyone and everything. That was the story of the 2008 Mets. Of course things look a bit better this year with J.J. Putz and Francisco Rodriguez on board. But still, I think I’m better off just closing my eyes in the seventh inning.